Where a substation has a metallic fence, it must be properly grounded to protect people from high voltages that may occur during a fault in the network. Earth faults at a substation can cause a ground potential rise. Currents flowing in the Earth's surface during a fault can cause metal objects to have a significantly different voltage than the ground under a person's feet; this touch potential presents a hazard of electrocution. Transmission substations can range from simple to complex. A small "switching station" may be little more than a bus plus some circuit breakers. The largest transmission substations can cover a large area (several acres/hectares) with multiple voltage levels, many circuit breakers and a large amount of protection and control equipment (voltage and current transformers, relays and SCADA systems). Modern substations may be implemented using international standards such as IEC Standard 61850. The input for a distribution substation is typically at least two transmission or sub transmission lines. Input voltage may be, for example, 115 kV, or whatever is common in the area. The output is a number of feeders. Distribution voltages are typically medium voltage, between 2.4 kV and 33 kV depending on the size of the area served and the practices of the local utility. The feeders run along streets overhead (or underground, in some cases) and power the distribution transformers at or near the customer premises. In distributed generation projects such as a wind farm, a collector substation may be required. It resembles a distribution substation although power flow is in the opposite direction, from many wind turbines up into the transmission grid. Usually for economy of construction the collector system operates around 35 kV, and the collector substation steps up voltage to a transmission voltage for the grid. The collector substation can also provide power factor correction if it is needed, metering and control of the wind farm. In some special cases a collector substation can also contain an HVDC converter station. Collector substations also exist where multiple thermal or hydroelectric power plants of comparable output power are in proximity. Examples for such substations are Brauweiler in Germany and Hradec in the Czech Republic, where power is collected from nearby lignite-fired power plants. If no transformers are required for increase of voltage to transmission level, the substation is a switching station. Converter substations may be associated with HVDC converter plants, traction current, or interconnected non-synchronous networks. These stations contain power electronic devices to change the frequency of current, or else convert from alternating to direct current or the reverse. 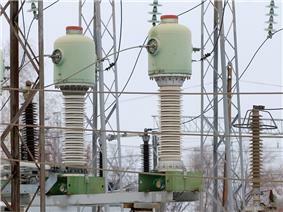 Formerly rotary converters changed frequency to interconnect two systems; such substations today are rare. A switching substation is a substation without transformers and operating only at a single voltage level. Switching substations are sometimes used as collector and distribution stations. Sometimes they are used for switching the current to back-up lines or for parallelizing circuits in case of failure. An example is the switching stations for the HVDC Inga–Shaba transmission line. A switching substation may also be known as a switchyard, and these are commonly located directly adjacent to or nearby a power station. In this case the generators from the power station supply their power into the yard onto the Generator Bus on one side of the yard, and the transmission lines take their power from a Feeder Bus on the other side of the yard. A compact substation is generally an unmanned outdoor substation being put in a small enclosed metal container in which each of the electrical equipment is located very near to each other to create a relatively smaller footprint size of the substation. Selection of the location of a substation must consider many factors. Sufficient land area is required for installation of equipment with necessary clearances for electrical safety, and for access to maintain large apparatus such as transformers. Where land is costly, such as in urban areas, gas insulated switchgear may save money overall. The site must have room for expansion due to load growth or planned transmission additions. Environmental effects of the substation must be considered, such as drainage, noise and road traffic effects. A grounding (earthing) system must be designed. The total ground potential rise, and the gradients in potential during a fault (called "touch" and "step" potentials), must be calculated to protect passers-by during a short-circuit in the transmission system. The substation site must be reasonably central to the distribution area to be served. The site must be secure from intrusion by passers-by, both to protect people from injury by electric shock or arcs, and to protect the electrical system from misoperation due to vandalism. The arrangement of switches, circuit breakers and buses used affects the cost and reliability of the substation. For important substations a ring bus, double bus, or so-called "breaker and a half" setup can be used, so that the failure of any one circuit breaker does not interrupt power to other circuits, and so that parts of the substation may be de-energized for maintenance and repairs. Substations feeding only a single industrial load may have minimal switching provisions, especially for small installations. An important function performed by a substation is switching, which is the connecting and disconnecting of transmission lines or other components to and from the system. Switching events may be "planned" or "unplanned". A transmission line or other component may need to be de-energized for maintenance or for new construction, for example, adding or removing a transmission line or a transformer. To maintain reliability of supply, no company ever brings down its whole system for maintenance. All work to be performed, from routine testing to adding entirely new substations, must be done while keeping the whole system running. Perhaps more important, a fault may develop in a transmission line or any other component. Some examples of this: a line is hit by lightning and develops an arc, or a tower is blown down by high wind. The function of the substation is to isolate the faulted portion of the system in the shortest possible time. De-energizing faulted equipment protects it from further damage, and isolating a fault helps keep the rest of the electrical grid operating with stability. ^ Joint Consultation Paper: Western Metropolitan Melbourne Transmission Connection and Subtransmission Capacity, accessed and archived 4 January 2013. R. M. S. de Oliveira and C. L. S. S. Sobrinho (2009). "Computational Environment for Simulating Lightning Strokes in a Power Substation by Finite-Difference Time-Domain Method". IEEE Transactions on Electromagnetic Compatibility 51 (4): 995–1000.